Preserving is always so satisfying, and sometimes incredibly beautiful. My two little blood plum trees, only in their second summer, have been ridiculously prolific. Mariposa and satsuma - they pollinate each other and are clearly happy together! I've bottled them whole, which means that there is a fair bit of space in the bottles, but they look so pretty! I used a light sugar syrup, and didn't cook them in the water bath for very long. 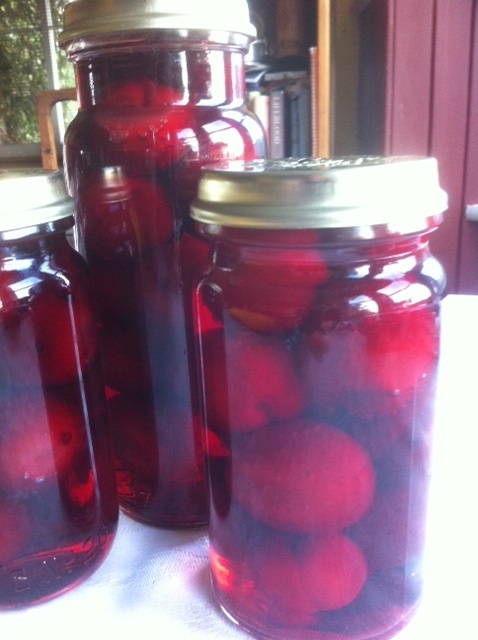 The result: almost crisp, almost tart, delicious plums in a gorgeous crimson nectar. A definite winner!